After several hours of driving through the unfamiliar kudzu-less highways leading out of North Carolina and into Virginia, we arrived in Manassas and the complex sporting our new apartment home. To say that it has a slightly pre-fabricated aire to it would not do justice to the sheer ambition of the franchise salesmanship that defines (and owns) this DC suburb. 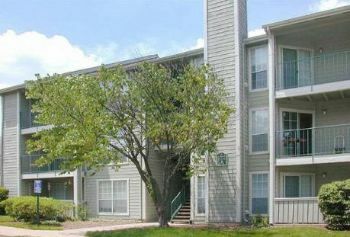 The photo here may be the exact apartment we live in. Or it may be one of the other 50 buildings that look just like it on the property. It’s hard to tell and, frankly, not worth the time. It is like every other element in this strip-mall existence in that it is made by a strict recipe and we are the latest reiteration of consumer to call it home. We live a block away from Costco. Also a block from Chilis, Taco Bell, Best Buys and only a short distance from K-Mart, Wal-mart and Target. There is not a franchise that has been invented that is beyond a few square miles of us. There is not a consumer need I could imagine not being satisfied a thousand times over. Liz and I set up a temporary life with the extraordinary kindness and thoughtfulness of a few church people who made sure we had everything we needed. A few lamps and chairs, blankets and sheets and a dinner or two and we’ve been all set. Our neighbors have been very kind and helpful. And it is interestingly diverse. Some have helped us move furniture, but mostly we have interacted with other dog owners – Those who Blondie drags us over to see – especially when they are bar-b-queing out on their front porch. We were greeted by a bit of fanfare on our first full day here. 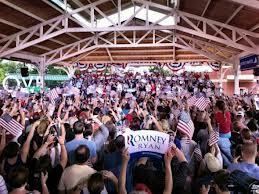 Mitt Romney paid a visit to the fair people of this swing state. 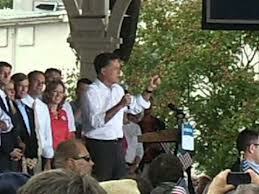 It was the day he announced Paul Ryan as his running mate so they ran over to Harris Pavillion (ONLY 2 BLOCKS FROM THE CHURCH) directly from the USS Wisconsin (where Mitt Romney introduced Paul Ryan as ‘the next president of the United States’). In an interesting bit of irony, the ‘Re-elect President Obama’ office opened to great support only two blocks from the church as well. Liz and I went and met some great people. Liz signed up to be a phone banker and a canvasser and we put on our Obama stickers just as we headed over to get in line to see Mitt Romney speak. We had a number of fairly intense – but very good – conversations with ardent Romney supporters. Our primary conversations partners consisted of a couple with three teenage children. They were small business owners and were very concerned about the economy – feeling that President Obama had misappropriated funding to the banks and healthcare and the poor in general. Hours of conversation – with rare but important areas of shared values – made the two hours we spent in line very much worth our while. When we got to the metal detectors, the person working security pulled us aside and said, at first, that we couldn’t come in. I asked why and he pointed to our Obama stickers. I mentioned that it was a bit of irony that the process to elect a president that stood for a country that protected freedoms was an interesting place to ban public engagement. 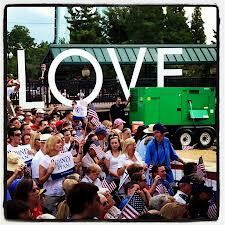 The most interesting thing I heard about the whole event was that the Romney campaign noticed the big LOVE sign that is the backdrop for the Harris Pavillion. When they saw it, they asked for it be removed. What about LOVE, I wondered, are they afraid of or offended by?